Rockford, Ill. – The Rockford IceHogs, proud AHL affiliate of the Chicago Blackhawks, announced they have released Jake Dowell from his PTO and signed him to a one-year contract through the 2015-16 season. 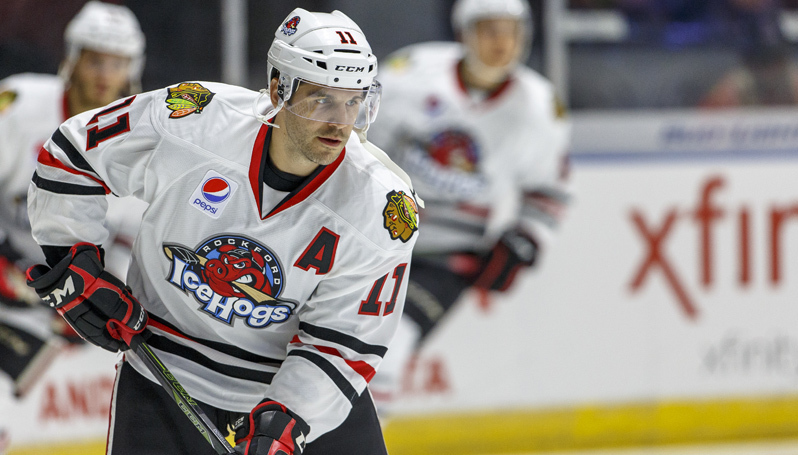 Additionally, the IceHogs have recalled forward Chris DeSousa from the ECHL’s Indy Fuel. Dowell, currently in his 9th professional season, has played for three NHL organizations throughout his long-standing career; the Chicago Blackhawks, Dallas Stars, and Minnesota Wild. Dowell first came to Rockford in 2007-08, and served as the IceHogs Captain two seasons later. For the Blackhawks, he has recorded 102 games, 26 points (9g-17a) and 80 penalty minutes. In Rockford, he has skated in 205 games, notching 20 goals and 40 assists (60 points) along with 292 penalty minutes. In 2004, the Wisconsin native was drafted by the Chicago Blackhawks in the 5th round, 140th overall. He spent his college years at the University of Wisconsin, winning an NCAA National Championship as junior year in 2005-06 and leading the Badgers in goals during his senior campaign (19). DeSousa, a rookie out of Mississauga, Ontario, is in the midst of his first full professional season. In his two games in Indy this season, DeSousa recorded one assist and nine penalty minutes. He appeared in both preseason games for Rockford this year. Upon completing his fourth season with the University of Prince Edward Island Panthers in 2014-15, he joined the Fuel for the last half of their season, playing in 20 games and notching 16 points (7g, 9a) along with 40 penalty minutes. Next Home Game: Friday, Oct. 23, vs. Chicago Wolves. Game time: 7 p.m. The IceHogs host their in-state rival Chicago Wolves in an Illinois Lottery Cup game. The first 4,000 fans through the gates will receive a magnet schedule compliments of Rise Broadband. Doors will open at 5:15 p.m. for a Blues Flame Lounge Friday. Fans 21-and-older are invited to enjoy live blues music, a happy hour special, and free appetizers.